I remember one particular year, a third of my students brought special struggles to the classroom each day. I had to be strategic in my planning and my teaching to make sure they were engaged and learning. It was something I had to constantly revisit. Something that might work for one student, wouldn’t for another. What worked for one student on Monday, might not work for them on Tuesday. I’m sure you get what I’m saying. The name of the game was flexibility and a calm presence. If I got frustrated (which would be unfair to the students) then they would end up frustrated. I had students who benefited most from close proximity to me. I had one student who sat on the perimeter of the pods all year because he preferred to stand most of the day. I had students who couldn’t transfer writing on the board to their own papers, so I gave them their own copy. I think the number one point to remember is that there is a child in that body who deserves to learn, who deserves to be cared about. Greet every student individually every time they enter your classroom. This is a daily reminder to them that you see them, that you care about them, and that you are glad they are in your classroom. Use formative assessment to guide instruction. Constantly take the pulse of your classroom through a variety of formative assessment tools. This way you know which students are ready to move on, and which need more of your attention. Your students (and their needs) should always guide the pacing and the methods for learning. Communicate regularly with home. Send home quick notes of praise for each student quarterly (at the least). I even kept a checklist so I could see who I still needed to recognize. Sometimes I would send a quick email, sometimes a phone call, sometimes a letter home with the child, and other times I would mail a postcard. This establishes and nurtures open communication with parents. It’s also important to send home, and/or digitally publish weekly newsletters to keep parents aware of what is happening in the classroom. Make personalized learning the norm in your classroom. Learning based on each student’s ability, interest, and readiness level is the number one best way to meet the needs of every learner. This is a greater possibility than you may think at first. 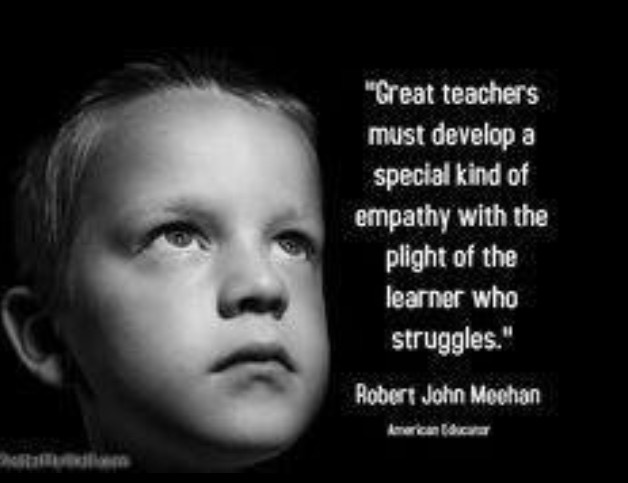 How do you empathize with the plights of struggling learners? What would you add to the list above? This entry was posted in Education, Relationships and tagged formative assessment, special education, teaching. Bookmark the permalink.